In all the years of running and pacing we have found that new runners (and even established ones) make the mistake of not choosing the appropriate pace. The consequences of this are that for every minute a runner runs fast in the first half he loses two minutes in the second half. Thus, not choosing an optimum pace results in a suboptimal performance. Another aspect is that many new runners running their first event have never run the full distance before. This puts them in a confusion of further estimating their correct finish time. Each pace calculator is customized for the event. The elevation profile of the course is factored into the calculator. The predicted temperature of the event is factored in. The start gate time for the event is also taken into account. 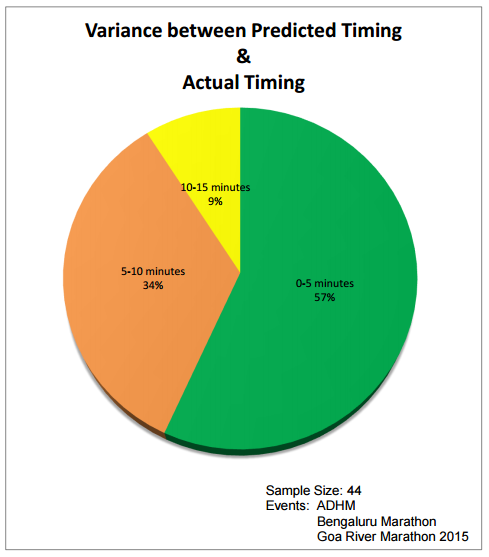 Runners input a training run time and arrive at the predicted finish time. Based on the different variables the pacing chart is drawn up and mailed to you.